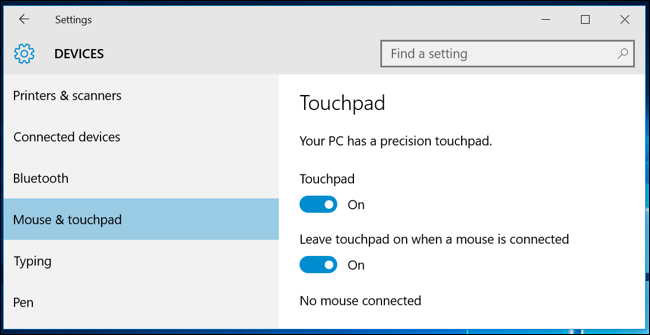 What Is a “Precision Touchpad” on Windows PCs? Windows PCs have historically had worse touchpads than Macs. Microsoft is trying to fix this problem with “precision touchpads”, but not every PC manufacturer is on board. Some PCs ship with precision touchpads, but others include older, traditional technology instead. Microsoft has announced it will begin requiring PC manufacturers to use precision touchpads in Windows laptops in the future, at some point after Windows 10’s Creators Update is released. This is good news for PC laptop users. Traditionally, Windows PC touchpads were implemented in a more one-off way. When you moved your finger across the touchpad, the touchpad driver has to look at the input and convert it to mouse input. The touchpad appears as a normal external mouse—either a USB or PS/2 mouse—to Windows itself. PC manufacturers have to tune the touchpad for their hardware, and the driver is responsible for handling the input. If the touchpad uses multi-finger gestures or has palm rejection support so you don’t accidentally move the cursor while you’re typing, this all has to be implemented by the touchpad driver. Microsoft decided to move towards a more standard approach starting with Windows 8.1. It created the “precision touchpad” specification along with touchpad company Synaptics. A PC with a “precision touchpad” doesn’t do all the hard work in its own hardware drivers. Instead, it sends the raw touchpad data to Windows itself. Windows is responsible for reading the input and processing the gestures. Windows understands your PC has a touchpad and approaches it intelligently. The touchpad doesn’t just pretend to be a normal mouse. A precision touchpad has some notable advantages. It can get better with time. As Microsoft improves Windows and its touchpad support, improvements can benefit all devices with precision touchpads. Devices with normal touchpads will continue to stay the same, as the laptop manufacturers won’t work on updating and fine-tuning old drivers. Microsoft added new four-finger gestures in the Anniversary Update, for example, but you’ll only get these if your Windows 10 PC has a precision touchpad. A precision touchpad is officially required to support Windows 10’s touchpad gestures, like the three-finger swipe upwards to open the Task View interface. The Creators Update will add the ability to assign custom shortcuts to various mouse gestures. Devices with normal touchpads may ship with some configurable gestures—and may even emulate Windows 10’s built-in gestures—but Microsoft can’t add new drivers and improve gesture recognition in the future. Because precision touchpads are standard, they can be customized from a standard configuration screen at Settings > Devices > Mouse & Touchpad. If you don’t have a precision touchpad in your PC, you’ll see many fewer options here. If you do have a precision touchpad, you’ll see the text “Your PC has a precision touchpad” along with all the useful options for configuring your touchpad and its gestures you’d expect. If you don’t have a precision touchpad in your PC, you’ll have to use a manufacturer-provided tool like the Synaptic control panel available at Control Panel > Hardware and Sound > Mouse > Clickpad Settings. These tools are more dated and won’t pick up new features Microsoft adds in the future, like the ability to customize exactly what gestures do in the Creators Update. Are Precision Touchpads Always Better? This doesn’t mean all precision touchpads are always better than all traditional touchpads. A “precision touchpad” doesn’t necessarily say anything about the underlying hardware. It’s just a different way of treating the touchpad’s input. For example, the Microsoft Surface Pro 2 was one of the first devices available with a precision touchpad. However, its touchpad was almost universally considered terrible. It was very small and made of fabric rather than a smooth surface, and just didn’t work well. It was less precise and more painful to use than most non-precision touchpads. However, if a manufacturer is creating a new PC, it can choose to configure the laptop’s touchpad as a “precision touchpad” or configure it in legacy mode and install the appropriate drivers. It would be better for the manufacturer to configure the touchpad as a precision touchpad rather than opt for the legacy approach. And manufacturers do get this choice—when creating a laptop with a Synaptics touchpad, manufacturers can choose to configure that same piece of hardware as a precision touchpad or use the legacy approach. This is a decision the manufacturer has to make during the manufacturer process, so you can’t change it afterwards. Why Don’t Some PCs Offer Precision Touchpads? Individual PC manufacturers would have to explain why they make this decision. Manufacturers may be conservative and prefer the legacy approach where they can configure the touchpad themselves rather than relying on Microsoft. They can ensure the touchpad always functions as promised, although it may not always work as well as it could. Some manufacturers may add additional features to their touchpad configuration utilities. They may want to “differentiate” their PCs by offering unique features that other PCs don’t offer, even if those features may not work as well. You may get more bells and whistles on a non-precision touchpad, but a precision touchpad may be more reliable and functional overall. But manufacturers won’t be able to make excuses for much longer. Microsoft is about to make the decision for manufacturers. Future versions of Windows 10 will require a precision touchpad. They’ll still work with older types of touchpads, but manufacturers will have to use precision touchpad if they want to preinstall Windows 10 on their laptops and have the official “Built for Windows 10” certification stamp of approval.